Plant bulbs in fall for spring flowers such as tulips. The best time to plant fall bulbs is usually when it's still comfortable enough to work outside and the ground isn't frozen, but there's no likelihood that temperatures will turn warm again. That balancing act can be tricky, especially when Mother Nature turns her whimsical eye on your gardening zone, but for the most part you can use several rules of thumb to judge when to plant fall bulbs. Fall bulbs are actually spring flower bulbs. All those bags full of things that look like miniature onions at the garden center are actually full of bulbs, a portion of the root system of a plant. They must be planted in the fall before they blossom in the spring into cheery crocus, fragrant hyacinth, sunny daffodils and majestic tulips. You've probably heard the old saying, "April showers bring May flowers." What also brings May flowers such as tulips is a long period of cold weather. Most spring flowering bulbs need several weeks of near-freezing or below-freezing temperatures in order to bloom. That's why spring bulbs must either be chilled in the refrigerator if forcing them to bloom indoors in pots or planted during the fall to ensure they receive natural chilling over the winter. Although it's more pleasant to garden during warm fall days, planting fall bulbs too soon may trick the bulbs into sprouting in the fall rather than waiting for springtime. Garden centers and retail stores stock bulbs many weeks before they should be planted in the ground. While it's fine to pick up packages of bulbs during the last half of summer, and indeed may be desirable to obtain the best selection, wait to plant them until cooler days arrive. Store them in a cool, dark place such as a garage, shed or basement until you're ready to plant them. Most bulb packages are rather vague about when you should plant bulbs, and there's a good reason for that. There's really no hard and fast day by which you should plant them. The best time to plant fall bulbs varies according to the weather conditions, your gardening zone, and your availability.One easy way to know when to plant fall bulbs is to look up the frost date for your garden zone and schedule time to plant them near that date. The frost date is the average first frost date for your area, and it is usually a good indicator of the time of year when temperatures dip near freezing. This is usually a reliable indicator that fall has truly arrived. Another way to remember when to plant fall bulbs is to use a holiday reminder. Columbus Day, Halloween and even Veterans Day are days already marked on the calendar, and you may have off from work or school on or near that date, so you have plenty of time to garden. These days fall near or after the frost date for most gardening zones, so they make perfect memorable dates to know when to plant your fall bulbs. In olden times, farmers knew when to plant crops by nature's signals. These subtle signals may be more reliable than a calendar, for each year they shift slightly based on the current weather patterns and conditions. Some signs that fall has truly arrived include trees shedding their leaves. If you know one particular tree in your area, such as an oak tree, loses its leaves last, watch for the time of year when that tree starts to shed its leaves. It's time to get those fall bulbs into the ground. Now that you have some idea of when to plant fall bulbs, you may want to brush up on your planting techniques and flower information before heading into the garden. Bulbs_in_Containers shares information on how to grow bulbs in pots, a useful skill for apartment dwellers or those with limited gardening space. 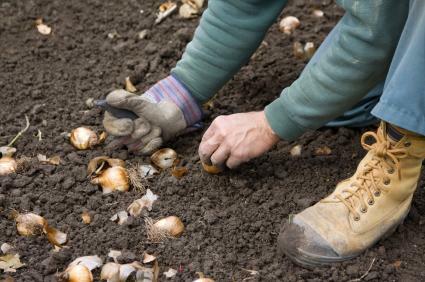 How_to_Plant_Summer_Bulbs teaches you how to plant summer blooming bulbs, when to plant them and more. Tulips have been loved and enjoyed by gardeners for centuries. Learn more about these popular spring blooming bulbs.